Basic Allowance for Housing (BAH) is one of the most valuable military benefits. The purpose of BAH is to provide a housing allowance for service members when military housing is not available or is otherwise not provided. BAH Rates are based on several factors including geographic duty location, pay grade, and dependency status. The rates are subject to change, and updated rates are usually released each December, and are effective on January 1 of the following year. Like many benefits, BAH is simple on the surface. But it can get a little complicated, depending on your circumstances. This guide covers a variety of frequently asked questions, including types of BAH, BAH eligibility, BAH Rates, how BAH is calculated, what happens when BAH rates change, and other frequently asked questions. How Many Kinds of BAH Are There? 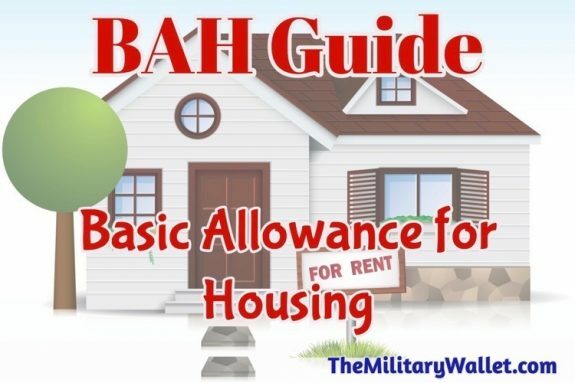 Basic Allowance for Housing (BAH) – Allowance for US military members to offset the cost of housing when government housing is not available. BAH With and Without Dependents Rates – BAH is also broken into with and without dependents rates. The Dependent Rate is the same regardless of how many dependents you have. Dual-military couples without additional dependents each receive the Without Dependents rate. If the dual-military couple has dependents, one will receive the With Dependents rate and the other will receive the Without Dependents rate. Partial BAH – Given to servicemembers without dependents who reside in government quarters. BAH Reserve Component/Transit (BAH RC/T) / BAH Type II – This is given to members of the Guard or Reserves who are activated for less than 30 days. It also applies for members who are in transit from a duty location with no prior BAH rate (such as overseas). BAH II is a fixed rate based on the national average for housing and does not vary by location. BAH-DIFF – BAH-DIFF is the housing allowance amount for a member who is assigned to single-type quarters and who is authorized a basic allowance for housing solely by reason of the member’s payment of child support. A member is not entitled to BAH-Diff if the monthly rate of that child support is less than the BAH-Diff. Overseas Housing Allowance (OHA) – similar to BAH, but only available to members stationed overseas or in US protectorates. Who is Eligible for BAH? The military has a limited amount of housing available for service members. This can include dormitories, barracks, and on- and off-base housing. BAH is usually offered to service members when housing is either not available or the member chooses to live in non-military housing. Do I Have to Live in Military Housing if it is Available? Sometimes, but not always. There are some cases when service members will be required to live in military housing if it is available. Other times you may have a choice. For example, single junior enlisted members may be required to live in base dormitories or barracks until they have dependents or reach a certain rank (depending on availability and other factors). Some military members may also be required to live in base housing in overseas locations, particularly for remote assignments or in locations where off-base housing is extremely limited or restricted to members of a certain rank or status. How Are BAH Rates Determined? The Defense Travel Management Office (DTMO) is the office that handles BAH. According to DTMO, Basic Allowance for Housing (BAH) is a U.S. based allowance prescribed by geographic duty location, pay grade, and dependency status. It provides uniformed Service members equitable housing compensation based on housing costs in local civilian housing markets within the United States when government quarters are not provided. A uniformed service member stationed outside the U.S., including U.S. territories and possessions, not furnished government housing, is eligible for Overseas Housing Allowance (OHA). (see more). Determines the total housing costs (median rent + average utilities) for each MHA for all the anchor points. Calculates (using the Housing Standards table above) a separate BAH rate for each of twenty-seven distinct pay grades that correspond to military ranks for members with and without dependents. Because these rates fluctuate, they are reassessed annually. Note: Much, much more goes into the calculations than we can cover in this article. The DTMO publishes a BAH Primer which covers the BAH formulas in much more detail. The process is very detailed and is designed to attain a 95% statistical confidence that the estimated median rent is within 10% of the true median rent. There are additional checks and balances in place to ensure quality control. Does BAH Cover 100% of Housing Expenses? That depends on how much of your BAH you spend. I know, not the answer you’re looking for, right? Contrary to popular belief, BAH was not originally intended to cover 100% of off-base living expenses. At one point it was only calculated to cover 80% of off-base living expenses, leaving service members to foot the remaining 20% of the cost themselves. It wasn’t until 2000 that the Secretary of Defense authorized an increase in BAH. The gap was gradually closed, and by 2005 BAH was increased to cover 100% of off-base living expenses. BAH rates remained set to cover 100% of median housing expenses as recently as 2015. However the 2015 & 2016 Defense Authorization Acts passed by Congress included provisions to decrease the percentage of expected housing costs BAH was supposed to cover. These budget authorizations made two major changes. The first was to eliminate the cost of renter’s insurance from the computation. That second was to introduce a cost-sharing element designed to shift some of the expense to the member. This cost-sharing element was set at 1% for 2015, and set to increase 1% per year until it reaches a 5% cost-sharing (or covers 95% of median housing costs for the Military Housing Area). Out-of-pocket expenses will be 1% in 2015, 2% in 2016, 3% in 2017, 4% in 2018 and 5% in 2019. Read more about BAH rate cuts. Why Doesn’t My BAH Rates Cover My Housing Expenses? (Or, I’m Spending Less Than My BAH). BAH Rates are set on median housing prices for your duty location. Buying or renting housing outside of the median price range for your rank and dependent status will affect whether or not your BAH will cover your total expenses or leave you with a surplus. Choosing to live in a larger or smaller residence than the median will affect how far your BAH goes. Additionally, choosing to live closer or further from your base may affect the rental prices. As with all real estate, it often comes down to location, location, location. Can I Use My BAH To Buy a House? Will BAH Cover My Mortgage? Yes, you can buy a house with your BAH. Whether or not BAH will cover your mortgage depends. There is no rule that says you can’t use your BAH payment to buy a home. Just be aware that by design, BAH does not consider mortgage costs, it only considers the median cost of renting. BAH may or may not cover your entire mortgage payment depending on many factors including the cost of the home, the size and location of the home, your downpayment, taxes, homeowner’s insurance costs, and other factors. Buying a home is a major decision and not one we can cover in this article. Just be aware there are many factors to consider outside of just your BAH for your market, including the cost of home ownership, closing costs, downpayment, homeowner’s insurance, taxes, maintenance, and the viability of renting out your home if you PCS. Positive factors to consider include potential market gains. Where Can I Find Current BAH Rates? Basic Allowance for Housing rates vary by location. The higher the cost of living, the higher the BAH rates. Some locations with a high cost of living may also be eligible for an additional Cost of Living Adjustment on top of the BAH benefit. Current BAH rates can be found on the DTMO website. To use the BAH Calculator, enter the year, your duty zip code, and pay grade. The calculator will return the BAH rate for your location for both the single and with dependents rates. You can also find more background information on current BAH rates on our site, including the amount of the most recent BAH rate increases or decreases, and other supporting information. What Happens When My BAH Rates Change? Simply put, you are protected—BAH Rate Protection has you covered. If BAH rates increase, your benefit increases and you will begin receiving increased BAH payments in your pay check. On the other hand, you will be grandfathered into the old rates if BAH rates for your area decrease. Individual rate protection prevents decreases in housing allowances as long as the status of a service member remains unchanged. Individual rate protection is important because changing BAH rates are common. For example, in the last few years, several important changes have happened that decreased BAH in multiple locations. See the above section under the heading “Does BAH Cover 100% of Expenses?” for a more in-depth explanation. I’ve Read Dual Military Couples Will Soon Lose Dual BAH. Is This True? Cutting BAH for dual military couples was proposed as legislation, but there was massive push back from multiple sources. The DoD is looking for ways to save money, and will continue to look for places to make cuts. Slashing dual BAH was proposed as a way to save money since dual military couples don’t typically have larger housing expenses than a family with only one military member. However, it’s easy to argue that BAH is an integral part of military compensation and taking away BAH from one member of a dual military household amounts to a significant pay cut. Doing so could also put many families in financial jeopardy if they have based their current housing arrangements based on their current BAH. As of publication, this proposal has been scrapped and will not happen. However, that does not mean Congress or the DoD will not revisit this in the future. For now, rest easy, your BAH has not changed. The Cost of Renter’s Insurance Was Removed from Calculations in 2015. Should I Still Buy Renter’s Insurance? Absolutely. Renter’s insurance is generally inexpensive (around $20 a month or less in many locations). It covers your belongings in the event of loss, damage, theft, and natural disasters. Covering your belongings is your responsibility, not your landlord’s responsibility. You can learn more about renters insurance in this article. You should also buy renters insurance if you live in the barracks. Protecting your belongings is your responsibility, not the military’s. Where Can I Find More information About BAH, BAH Rates, and similar topics? Chapter 10 of the Joint Travel Regulations. Title 37 USC § 403 covers BAH Law. What if your house is paid for? How does BAH work when one of our dependents goes off to college full time? Will my husband and I lose our BAH? Hello Renee, No, you should not lose your BAH. BAH is based on the military member’s rate, with dependents or without dependents. The with dependents rate will be the same whether you have one or more dependents. So the BAH rate will not change if a child goes away to college, provided there is still at least one more dependent living in the home (non-military spouse, another child, or another qualified dependent). I hope this is helpful and I wish you and your family the best. How about if you want to get marry with a people who is non-citizen. Do you still can get BAH? Hello Logan, Yes, you can get BAH as long as your spouse is registered with DEERS as a dependent. Hello Alex, Thank you for your question. BAH is set by law. I am not aware of any way to have it reduced. I would look into the terms of your lease or rental contract and see if there is a way to get out of it to find another house or apartment. You can work with your base legal department to see if they can assist you with this. How is BAH paid for the month of december and January? I understand they dont pay for the winter break, do they pay before winter break and then start back up mid January? Hello Khandice, BAH is paid out on a prorated basis while the student is attending college. So if the student is attending college for the first two weeks of the month, they will receive a proportional amount of BAH for that time. (All months are based on 30 days, so you can determine the daily amount of BAH by dividing the monthly amount by 30). BAH is paid out on the same schedule as you would normally receive it for that time period. For dual military, will my spouse receive BAH while at boot camp and A-School? Hi, how does the BAH work if the spouse is deployed to a different state than the one we live and there is no intend to follow? If a service member is single with a baby and moves out of Navy housing to go on Cruise, do they get to keep BAH while on cruise? My son hasn’t received his BAH for this month and his rent is due. He is in the field for training. What can be done? Hello Jason, He needs to work with his First Sergeant or his finance office for pay issues. As for making his rent while he is in field training, I recommend he contact his landlord to explain the situation and explain he is unable to make the payment today, but he will make it as soon as possible. How are BAH rates decided? Specifically, if I a coming from an overseas assignment in transit to school (meaning I don’t have housing) ‘What will be the BAH rate location deciding factor’? Hello Oliver, are you asking how they will decide which BAH rate you will have at your school? If so, I can’t answer that, as it will depend on several factors including the duration of your school, whether you are on or off-base, what your orders state, and possibly other factors. You should direct this question to your personnel/HR office, and/or finance office. One of these offices should be able to help you understand what is written on your orders and what your BAH rate will be. If you PCS in December to a location and its BAH is going down in Jan, what rate will you get? Can you arrive 31 Dec and still get BAH rate protection? Hello Troy, From what I understand, yes, you get BAH rate protection so long as you were receiving BAH in that area before the rates changed. That said, you should confirm this with your finance office. They will be able to provide you with a firm answer. There may be other factors that come into play as well. For example, if you are receiving a temporary housing allowance, but not BAH. So definitely verify with your finance office. What if my name is on a lease for an apartment in another state, will i be able to get BAH even though I do not “technically” live there ? i.e, I own a home in Cali but is stationed at Fort Benning, GA.
Hello King, Your BAH is based on your permanent duty station. BAH does not take into account previous leases, mortgages, or other housing arrangements. If you have a lease in another location, you should be able to break that lease if you receive PCS orders. There is a provision in the Servicemembers Civil Relief Act (SCRA) that provides for this. You should see your JAG for more information. The SCRA does not, however, have similar provisions to break a mortgage. If you PCS when you have a mortgage you should either sell the home or rent it out. I wish you the best, and thank you for your service! I’m in the Marines and my wife and I just got married. But she’s not a resident or a U.S citizen. Can she still be allowed to live with me on base? And get BAH? Hello Chris, You will need to speak with your personnel office, or whoever handles the DEERS enrollment process (DEERS is the system that enters dependents into the military system for ID cards and benefits such as TRICARE). They will let you know what steps you need to take to get her enrolled, and how to get her an ID card. Here is how to enroll a dependent in DEERS. BAH is paid to the military member, no to the spouse. But yes, you would most likely qualify for BAH once you get your wife registered in DEERS. I leave May 28th for BMT with the Airforce and my recruiter told me I would be getting BAH. I am considered single w/ a child(dependent). He said since I was entered into the DEERs system w/ a dependent I would be entitled BAH. I’ve read multiple different answers online on whether or not I would be getting BAH while not being married. Just looking for some confirmation, thanks! I am listed as his primary caregiver, if that matters as well. Hello Alan, Your recruiter should be correct – you should receive BAH if you have a dependent listed in the DEERS system. The dependent does not have to be a spouse, it can be a child. hello, i leave to BMT next month, i pay my parents rent to help with the mortgage, do i qualify for BAH ?? Hello Coach, You generally only qualify for BAH if you have dependents when you join the military, such as a wife or child(ren). Otherwise, you will receive housing in the base dormitories. Your previous or current obligations don’t influence your ability to receive BAH when you join the military. You can discuss this in more detail with your recruiter. My spouse is Active Duty Army. My kids and I went to Korea with him and lived on post. My kids and I came back states after an ERD was approved. His command is saying my spouse is only entitled to BAH II. I have read AT 608-99 but it doesn’t completely explain our situation. Side note….we are NOT legally separated and there is no court order. He sent us home and quit financially supporting us all together. Hello Dana, This is outside my area of expertise. If you are still in the DEERS system as a dependent, then you can go to the closest military installation and speak with the finance office or other customer service office. They can look up the situation and help you understand what the benefits currently are and if they should be different. I wish you and your family the best.